Electronic music is no longer weird noises made by scruffy people in the basement of the music department. Electronic music is now as important a part of the music scenery as string quartets or marching band, and an essential factor in a musician's education. After all, it's been sixty years since Pierre Henry's music concrete began appearing in the airwaves of Paris, and over a century since Thaddeus Cahill built his Telharmonium. The UCSC Electronic Music program is one of the most comprehensive undergraduate programs at any university. It is a two year course of demanding study, in which students spend at least 8 hours of studio work and 4 hours in class each week. The courses are all taught within a context of composition studies, with exercises chosen to develop skill with the tools, and with tools chosen to encourage the student's growth as composers. The graduate program is tailored to the specific needs of each student. In conjunction with their individual composition teachers, they select tools from a wide choice of technologies to further their creative work. 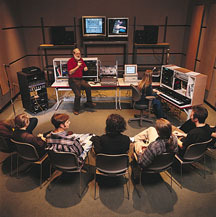 Quarterly seminars address issues in research or advanced techniques. For further information, follow these links.